"Point is, this was hard-earned, and the whole world uses this calendar, it is the most accurate calendar ever devised." I have linked both to his explanation of the Gregorian calendar, and also to where the actual quote is found. If you start listening from the explanation, the quote I've transcribed will be made about 2 minutes in. After the quote is made, he further elaborates on leap years. Also, if this question is too hard to answer definitively, is it at least a fair statement to make? Is Neil Tyson's claim that the Gregorian calendar is the “most accurate calendar ever devised” true? We're trying to track how long it takes the Earth to repeat its seasons. Tracking how long it takes the Earth to repeat its the seasons is a bit vague, but no matter how one construes that phrase, the Gregorian calendar is not "the most accurate calendar ever devised." There are other extant calendars that do a better job. The reason tracking how long it takes the Earth to repeat its the seasons is a bit vague is that the concept has multiple possible meanings. One concept of tracking the seasons as a whole is that of the tropical year. This is the time it takes for the mean fictitious Sun to advance in mean tropical longitude by 360°. Meeus, Jean, and Denis Savoie. "The history of the tropical year." Journal of the British Astronomical Association 102.1 (1992): 40-42. (This reference is used as the source of all of the statements in this paragraph.) The tropical year was 365.242190 days of 86400 TAI seconds at the J2000 epoch (2000 January 1 12:00 TT). The tropical year differs slightly from the mean vernal equinox year, 365.242374 days at the same epoch. The reason for the discrepancy between the tropical and vernal equinox years is that Earth perihelion currently occurs a dozen days or so after the December solstice. This makes northern hemisphere spring and summer currently be longer than northern hemisphere autumn and winter, but it also means that spring is getting shorter while autumn is getting longer. The website dateandtime.com on its How Accurate Are Calendars? page chooses the deviation from the current tropical year (365.242190 days) as its accuracy metric. The following table shows their ratings of various calendars with regard to this metric. There is no indication regarding how, or even if, the Mayans adjusted their calendar to reflect the fact that a seasonal year is a bit less than 1/4 of a day longer than 365 days. The problem is that the 16th century Spanish intentionally destroyed every bit of Mayan literature they could find. The entry on the Persian calendar, more precisely the Iranian or Solar Hijri calendar (wikipedia article: https://en.wikipedia.org/wiki/Solar_Hijri_calendar) is quite incorrect. The table references an unofficial formulaic version of the Solar Hijri calendar. The Solar Hijri calendar tracks the apparent vernal equinox year rather than the tropical year, and within the constraint of using leap days, it does so with near perfection. The reason the Solar Hijri calendar is "perfect" (well, almost perfect) is that it is an observation-based calendar rather than a calendar based on a fixed formula. The first day of the year in that calendar is the day of the whose start time, local apparent midnight near Tehran, is closest to the apparent vernal equinox. This is equivalent to having the new year occur on the day of / the day after the vernal equinox depending on whether the vernal equinox occurs before / after local solar noon. This is accomplished by adding a leap day to the last month of the year when needed. Most of the time this happens with three ordinary years between leap years, but occasionally with four ordinary years between leap years. Multiple comments that have since been moved to chat asked me to explain the difference between a formulaic calendar and an observation-based calendar. The Julian calendar in which years divisible by 4 are leap years, the Gregorian calendar in which years divisible by 4 except those that are divisible by 100 but not by 400, and the Revised Julian calendar in which years divisible by 4 are leap years except for years that are divisible by 100 but do not leave a remainder of 200 or 600 when divided by 900 are all examples of formulaic calendars, as is the algorithmic version of the Solar Hijri. An observation-based calendar instead ties the calendar to some highly observable, and hopefully predictable event. Note well: Just because such a calendar is based on observation does not mean that leap years are not predictable. The vernal equinox is a highly observable event, and except for those very rare occasions where vernal equinox falls very close to local solar noon, whether vernal equinox will occur before or after local solar noon is also highly predictable. Valid predictions can be made centuries in advance with the aid of accurate ephemerides and Earth orientation models in the vast majority of cases where the time difference between the vernal equinox and local solar noon is a few tens of seconds or more. Note well: All highly accurate ephemerides are themselves inherently observation-based. Things will get dicey when the time difference between the vernal equinox and local solar noon is in the milliseconds. Here there is a chance of erroneously declaring the day on which the vernal equinox will occur to be a leap day, only to find that apparent vernal equinox occurred a fraction of a millisecond before rather than after local solar noon. Oops. That leap day should have been new year. But this is a one in a million event, and it will naturally be corrected on the very next new year. An observational calendar will inevitably beat any formulaic calendar, particularly if one considers the problem of keeping a calendar accurate for hundreds of thousands of years. The problem is that a calendar that attempts to track the seasons and do so over long spans of time has to address three key interacting rates, the Earth's daily rotation and its axial and apsidal precession rates. A formulaic calendar that ignores changes in these rates is doomed to failure, while a calendar that tries to incorporate such changes is also doomed to failure because the future of these rates is uncertain, particularly the Earth's rotation rate. The Persian Calendar, also known as the Iranian Calendar, is made available in a similar fashion for it is the most accurate of calendars. These calendars are included for the millions of people who use them regularly. Wikipedia: Revised Julian calendar Trpković advocated this calendar in preference to the Gregorian because of its greater accuracy and also because the vernal equinox would generally fall on 21 March, the date allocated to it by the church. In the Gregorian, it generally falls on 20 March. As in the Gregorian, end-century years are generally not leap years, but years that give remainder 0 or 400 on division by 900 are leap years. The changeover went into effect on 17 February/1 March. The Gregorian calendar improves the approximation made by the Julian calendar by skipping three Julian leap days in every 400 years, giving an average year of 365.2425 mean solar days long. This approximation has an error of about one day per 3,030 years with respect to the current value of the mean tropical year. However, because of the precession of the equinoxes, which is not constant, and the movement of the perihelion (which affects the Earth's orbital speed) the error with respect to the astronomical vernal equinox is variable; using the average interval between vernal equinoxes near 2000 of 365.24237 days implies an error closer to 1 day every 7,700 years. By any criterion, the Gregorian calendar is substantially more accurate than the 1 day in 128 years error of the Julian calendar (average year 365.25 days). Mädler's correction proposal has almost been forgotten. However, his proposal for calendar regulation can hardly be surpassed in its exactness due to the insignificant difference to the tropical year. The Maedler calendar system would become even more accurate during the 20th and 21st centuries and reached its optimum in 2033 (according to VSOP87 and 2048). According to the newer VSOP2000, the length of the tropical year decreases by about half a second per century. This means that with continued switching according to Gregorian switching rule the calendar would have shifted after 3231 years (thus in the year 2803) already in relation to the astronomical starting point in the year 1582 by one day. The primary equinox would then take place permanently one day earlier. With schematic-extrapolative application of the Mädler switching rule, however, a need for correction (insertion of an additional leap day) would only be expected 331,126 years after its introduction. For a simple observation that the original claim is just a misleading oversimplification, the above should be enough. The Gregorian calendar is quite accurate and relatively easy to handle. This makes for an almost elegant solution, which is probably what the claimant meant. But it is by far not an ideal calendar and there have been systems devised before and after the Gregorian that are on this single scale "accuracy" a better choice. Different calendars were devised to solve different problems. The Gregorian calendar solves the problem of having the Christian holiday of Easter reliably in spring time and relative to the related equinox. It's nice to see the hyperbole of "is the most accurate ever devised" from the claimant praising a pope and his computus aware mathematicians for their concern of religious matters. That almost none of the efforts of improving on it since goes unnoticed in the claim is lamentable. That none of the ideas of metrification, that is basing this measurement of time on natural constants – like it was done for meter and second – is even considered necessary seems quite curious. Julian day is the continuous count of days since the beginning of the Julian Period and is used primarily by astronomers, and in software for easily calculating elapsed days between two events (e.g. food production date and sell by date) The Julian Day Number (JDN) is the integer assigned to a whole solar day in the Julian day count starting from noon Universal time, with Julian day number 0 assigned to the day starting at noon on Monday, January 1, 4713 BC, proleptic Julian calendar (November 24, 4714 BC, in the proleptic Gregorian calendar), a date at which three multi-year cycles started (which are: Indiction, Solar, and Lunar cycles) and which preceded any dates in recorded history. For example, the Julian day number for the day starting at 12:00 UT on January 1, 2000, was 2 451 545. The Julian Period is a chronological interval of 7980 years; year 1 of the Julian Period was 4713 BC. It has been used by historians since its introduction in 1583 to convert between different calendars. The Julian calendar year 2018 is year 6731 of the current Julian Period. The next Julian Period begins in the year AD 3268. For example, the Iranian solar calendar is systematic and quite accurate, but has constant switching rules. Therefore, the question remains whether the Gregorian calendar can be simplified and better adapted to our lives today. As has already been said, one goal could be to avoid or reduce the error of the Gregorian solar year, which means that another leap day has to be omitted in the 4th year dew. One could therefore change the switching rules, e.g. by not all century years divisible by 400 remaining leap years, as is currently the case, but only those whose number of years divided by 9 gives the remainder 2 or 6. So 2000 and 2400 would be leap years as before, but then not 2800, but only 2900, not 3200, but 3300, not 3600, but 3800, etc. All other century years are normal years with 365 days. This reform year of the Oriental churches was decided in 1923 by the Congress of these churches in Constantinople, chaired by Patriarch Meletius IV, and was to be introduced in Russia, Greece, Serbia and Romania. Since the date should be corrected by 13 days and Easter should no longer be determined cyclically but astronomically according to the meridian of Jerusalem, this reform would also be acceptable for the Western churches, especially since differences will only occur from 2800 in the solar year. Unfortunately, this has not yet been introduced because, on the one hand, resistance against the change of date arose in the Eastern Churches, as celebrations for up to 13 day saints would be affected. On the other hand, however, the astronomical calculation method offers counter-arguments, because now one is again dependent on the correct calculation of an institution and its distribution of the official full moon data. Both the leap second of the previous passage and this full moon indication would use a modern Pope Maximus as in ancient Rome or an Easter letter writer as in the time of early Christianity. No wonder then that no agreement has yet been reached on this proposal. However, the adoption of the new switching rule would have the advantage that the duration of the solar year would be reduced to 365 d 5 h 48 m 48 s. This is 24 seconds better than the Gregorian year, leaving only a residual error of 2 customers, which would only add up to one error day after about 40,000 years. Unfortunately, however, this switching rule is not as easy to remember as the rule of the century up to now. Furthermore, it has the disadvantage that now 1600 should not have been a leap year! A suggestion by J.H. Mädler (1794-1874), with which he wanted to reduce the errors of the Gregorian calendar[Sele 81], should be mentioned at this point. With a chain fracture development of the length of the solar year it received the approximation 365 31/128 d, thus 365.242 19 d. This means the use of 31 leap days in 128 years and would have the advantage that an error of one day would not accumulate for more than 100,000 years. If it had been introduced in 1900, it would have been 2028, 2156, etc. Normal years without leap day, during 2100, 2200 etc. leap years remained. But this could not be achieved in the 19th century. Only in our days does an operational cycle of 128 = 27 years no longer seem so strange. Another proposal for a future calendar tries to make the quarters the same length, e.g. 13 weeks with 7 days, i.e. 91 days, resulting in 364 days as the length of the year. The 365th (aand possibly 366th) day would be celebrated as a holiday (New Year, leap year) and removed from the continuous weekday count. Then all data would be bound to their weekday, would be repeated quarterly, but the length of the month would have to be changed so that twice 30 and once 31 days per quarter occur. For Easter too, a fixed Sunday would have to be specified, for example the first Sunday in April, i.e. 7 April, when the year thus reformed begins with a Monday. Despite numerous debates, it was not possible to overcome the resistance, especially since all traditionalists are now in the same camp: to interrupt the continuation of the weekday count, to redefine the length of the month, to set up the additional celebration days (31.12. and 31.6. of a new kind) and to fix all movable celebrations, that is simply too much! So we will stick to the Gregorian calendar for the foreseeable future. Is it therefore not useful to have read and experienced something about its meaning in the world, its origin, its structure and its problems? At least we know some not so obvious oddities and curiosities with which we are used to live. –– by the Catholic church. –– that was actually adopted for wide spread use in the Western dominated world. It's a fair statement to make, even if not true (and especially not when taken out of context). From the context it's apparent that he meant predictive calendars in widespread use. Also one can imply that fairly simple rules can be qualification needed for everyday use. I think it's obvious that with today's knowledge of mathematics and physics even the man uttering the original quote could devise more precise calendar (here I do not want to diminish him - he's mainly science communicator). There are more recent simple calendars in use which are more precise (e.g. Revised Julian). Additionally today we can predict observation-based calendars millennia into the future (Iranian calendars). However, it's important remember that Gregorian calendar was devised before Leibnitz and Newton (and recent foundations they had built upon), which gives the achievement and the fact we still use it today the weight Neil deGrasse Tyson meant. The discussion is actually pretty complicated if one considers that the tropical year (the physical yardstick typically used to measure calendar accuracy) is not actually constant, and that several models exist for the latter (linear, quadratic, cubic), or that we can't actually perfectly estimate the length of the tropical year far in the future (there's an error margin for the astronomical observations). our Gregorian calendar will not deviate from the exact solar calendar by significantly more than 1 day for some 2000 years to come. On the other hand, a model cited by Wikipedia, Blackburn & Holford-Strevens' diverges in the year 3200 (I think they use a linear model). Anyhow, this is further in time than the predictive calendar of Milanković. 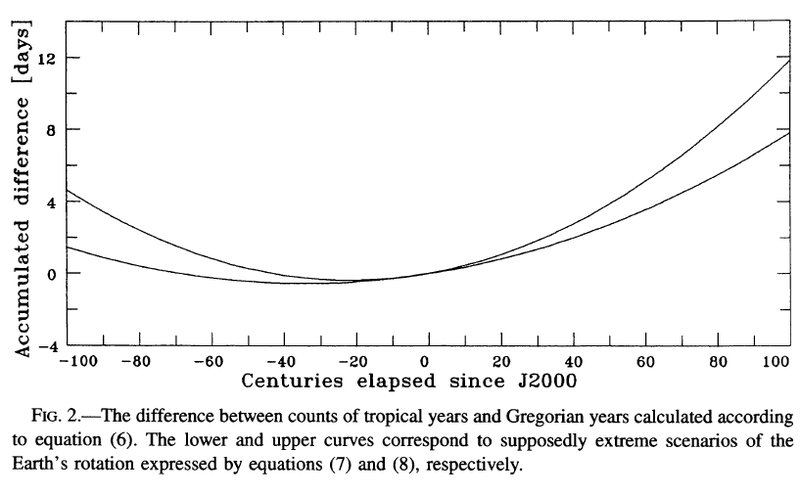 So it looks like there's not much to fret about in terms of the accuracy of the Gregorian calendar for the next 800 to 2000 years, depending on the tropical year model. Thus my conclusion about Tyson's saying as being roughly true. Even if more precise (in theory) calendars have been devised, the practical impact of the difference in accuracy would take hundreds or thousands of years to be experienced. Julius Caesar instituted the Julian Calendar in which a year has an extra day if its number is evenly divisible by 4: 4, 8, ... 1996, 2000, 2004 ... Thus the average year has 365 + 1/4 = 365.25 days. The sign of the error changed in moving from the no-leap-year calendar to the Julian system. The simple system had a positive error meaning the calendar year is too short and so dates slipped earlier: Christmas in the fall. The Julian Calendar has a negative error so Christmas moved later and later through the winter and into the spring. - By 1582 the drift of the Julian Calendar amounted to about 10 days and was quite noticeable. So Pope Gregory XIII decreed that 10 days were to be skipped and instituted the Gregorian Calendar. According to this calendar leap years usually occur every 4th year but are skipped every 100 years unless the year is divisible by 400. 400, 800, 1200, 1600, and 2000 ARE leap years but 100, 200, 300, 500 . are not. Thus 2000 is a leap year but 1900 and 2100 are not. A four-century period will be missing 3 of its 100 Julian leap years, leaving 97. So the average year has 365 + 97/400 = 365.2425 days. 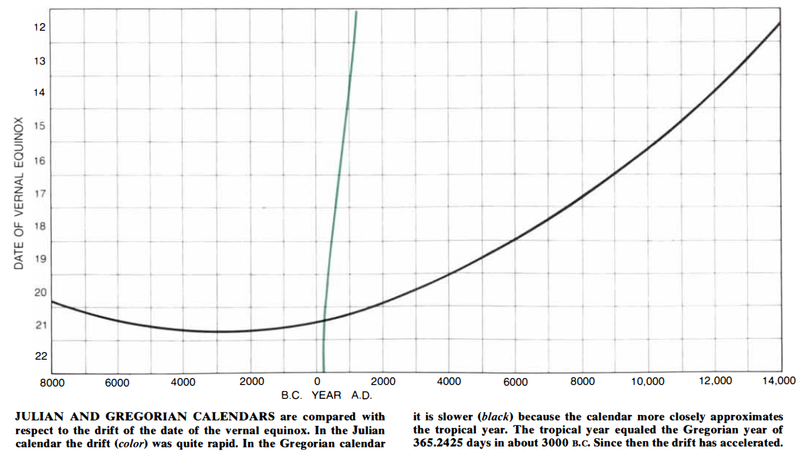 A final tweak has been proposed for the Gregorian system: removing leap years every 4000 years. Then 4000, 8000, 12000 etc. would NOT be leap years. A four-millennium period that would otherwise have had 970 leap years then has 969 leap years. The average year would then have 365 + 969/4000 = 365.24225 days. Alternatively, the 400-year correction could be effectively changed to a 450-year correction with a pattern of 2 century-ending leap years per 900 years. This is what the "Revised Julian Calendar" of the Eastern Orthodox church does. 365 + 218/900 = 365.242222. They have chosen which 2 centuries those are so that this calendar and the Gregorian Calendar agree during the period from 1600 to 2800. So as you can can see, average year length is not exactly constant over the long run. If society in the future still attaches importance to the synchronization between the civil calendar and the seasons, another reform of the [Gregorian] calendar will eventually be necessary. According to Blackburn and Holford-Strevens (who used Newcomb's value for the tropical year) if the tropical year remained at its 1900 value of 365.24219878125 days the Gregorian calendar would be 3 days, 17 min, 33 s behind the Sun after 10,000 years. Aggravating this error, the length of the tropical year (measured in Terrestrial Time) is decreasing at a rate of approximately 0.53 s per century. Also, the mean solar day is getting longer at a rate of about 1.5 ms per century. These effects will cause the calendar to be nearly a day behind in 3200. The number of solar days in a "tropical millennium" is decreasing by about 0.06 per millennium (neglecting the oscillatory changes in the real length of the tropical year). This means there should be fewer and fewer leap days as time goes on. A possible reform would be to omit the leap day in 3200, keep 3600 and 4000 as leap years, and thereafter make all centennial years common except 4500, 5000, 5500, 6000, etc. But the quantity ΔT is not sufficiently predictable to form more precise proposals (Blackburn & Holford-Strevens 2003, p. 692). So it's somewhat pointless to claim accuracy in the long run for any calendar scheme that is purely periodic. [His proposal] gives an average length for the calendar year of 365 days, 5 hours, 48 minutes and 48 seconds, which differs by only 2 seconds from the present length of the tropical year. Nevertheless Lilius' rounding off was actually fortuitous as it made his estimate closer to present-day value than that of his contemporaries. The baha'i calendar is defined to start each new year at the spring solstice. Whereas with most other calendars you can precalculate the date of say march 21st thousands of years in advance (eg to find out on which weekday it will fall) and then ask: is this still coinciding with the actual spring solstice? In the baha'i calendar you first need to check astronomical data to calculate the exact occurrence of the spring solstice in order to place new year's day, and then you can count the days up to then to find out the weekday for new year. In other words the baha'i calendar is automatically self correcting each year because it is defined by an astronomical event. The problem with all calendars is that the Earth's rotation is not stable, but decreasing in an unpredictable and irregular way. Or, to put this an other way, the traditional Gregorian calendar is not accurate at all. To keep such a calendar accurate, we have to sprinkle with leap seconds and leap days. If you want a really absolutely accurate calendar, don't look at the movements of the planet but just use the Julian Date, as defined by the number of days since 1 Jan 4713BC. No leap days, just counting days. You might object as JD being a calendar, but if we take the Wikipedia definition: A calendar is a system of organizing days for social, religious, commercial or administrative purposes, why not? Just like the decimal system made computations easier with money (100 cents instead of e.g. 12 pence) and other measurements. Better 100 centimeters instead of miles / yards / feet / inches / mills (you get the point). In fact, take seasons. You learned in school that autumn starts on 21 September? The weather service divides the year into 4 seasons of 3 whole months for simplicity, so autumn started last week on 1 September. Just imagine, you keep track of the maximum temperature of each day, and want to do the statistic of finding out which summer was the hottest over the past 200 years. Quite complicated if summer ends at, mostly, 21 September, but in some years 22 September. According to the site of our (Dutch) weather service, the international club Societas Meteorolica Palatina decided in 1780 (that is before the internet) to use seasons of three whole months. See also Wikipedia. Back to the question, the Greg Cal is the most complicated calendar ever devised, because it recognized that you cannot just add a leap day every four years, but have to make exceptions on this rule almost every century. Having to add leap days in, basically, ad-hoc manner, means that this calendar is NOT ACCURATE. Julian Date could be considered a calendar because you could organize society with it, has been devised in the past (1583), and is accurate because it does not need leap days. Not the answer you're looking for? Browse other questions tagged quotes astronomy time science . Is there no link between the meteor that affected Russia and the asteroid 2012 DA14? Did classical Greeks claim that children are solely products of the father's sperm? Did Maxim Gorky say “The most beautiful words in the English language are 'not guilty'”?